Portable Closet Just $39.99! Down From $80! PLUS FREE Shipping! Hurry over to Amazon where you can get this Portable Closet for just $39.99 down from $79.99 PLUS FREE shipping! Are you looking for additional storage space for your coats, gowns and dresses? 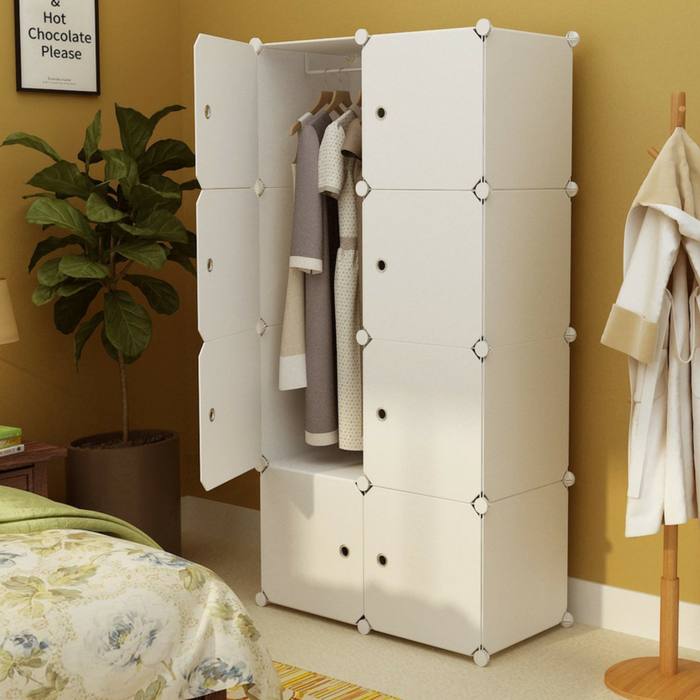 This easy-install wardrobe will meet all your storage needs. Features a large open space, leaving room for clothes to breathe. Made with durable stainless steel and resin, it is dirt-proof and easy to clean. Not to mention, unlike cheap wardrobes, it won’t degrade over time or collapse, nor will it get moldy or otherwise damaged by humidity, keeping your clothes fresh. 【SPACIOUS STORAGE CLOSET】One hanging section and five storage cubes offer you extra space for heavy outfits, folded clothes and belongings. 【STRONG & STURDY DESIGN】 Each cube supports up to 22 lbs.Our wardrobes are made of high quality resin composite materials and steel tubes. 【ELEGANT & SMART DESIGN】We made our closets with a sophisticated look and texture so that they can gracefully fit into your house. Measures in at 28″(W) x 19″(D) x 58″(H) , suitable for dorms, apartments, garage and walk-in closets. 【SIMPLE & QUICK ASSEMBLY】Tool-Free assembly in a brief time with detailed installation manual and video from KOUSI. 36 panels，30 connectors and 1 hanging rails can be made into as a single portable wardrobe or any single storage unit you prefer. Rubbermaid Closet Kits Just $66.74! Down From $160! PLUS FREE Shipping! Amazon has this Rubbermaid Closet Kits on sale for just $66.74 down from $159.99 PLUS FREE shipping! Your dream closet is easy to build with Rubbermaid Configurations Closet Kits. This 3-6 feet closet kit includes all the pieces you need to maximize your existing closet space and create smart storage for your clothes, accessories, and more. Easily configurable, this system includes telescoping clothes rods, adjustable shelves, and hardware for quick and easy installation.